Concertgoers flee the site of an active shooting at a concert in Las Vegas on October 1, 2017. Image courtesy of ABC News. 59 people were killed and over 500 were injured. There have been only a couple of times in my life where it felt as if the society around me found itself in an existential crisis. Unbelievably, it seems as if few acts of violence are capable of causing that level of reaction and reflection anymore. This is my attempt to explore the genesis of the incapacity not as a political or ideological conflict, but as a cultural moral injury. The perpetrators of the "Columbine Massacre," Eric Harris (Left) and Dylan Klebold (Right). My first experience of this shattering of innocence came in the immediate wake of the execution of twelve students and a teacher and the subsequent suicides of the perpetrators Eric Harris and Dylan Klebold, on April 20, 1999 at Columbine High School. I had friends at Columbine, hiding in adjacent rooms. I had performed in their auditorium just a couple of months earlier as part of a community choir and had set up risers with the stage manager, one of the shooters who seemed kind and helpful. In the days after the shooting my friends and I sat on the infamous hill above the school on which crosses for each of the victims had been placed and outpourings of grief and anguish scattered on every square inch of open space. You could smell the flowers from the parking lot over a hundred yards from the hill. And what seemed like an earth-shattering existential crisis in which we doubted the goodness of the world, quickly became something entirely different. Violent video games, bullying, and maybe some depression or other mental instability were (almost immediately) blamed. No matter the cause they had one thing in common, they were causes that lacked agency, that weren’t contagious, and certainly had nothing to do with the fundamental commitments of our entire society. This was an outlier, an exception, albeit an excruciating one. It was time to move forward, or more precisely, to move back to the real world from which this tragedy had removed us. I was conscious enough even as a sophomore in high school to recognize that, at least to some extent, this was smoke and mirrors. But it is only in hindsight that I have come to recognize the danger and insidiousness of this psychological "self-defense" mechanism that pervades our entire society. A 2016 ABC News story details for us that there have been fifty mass murders or attempted mass murders at a school since Columbine. Seventy-three percent of those perpetrators had absolutely no prior criminal record. More than two-thirds of those who went to schools with premeditated plans of murder got their guns from home or from extended family. Sixty-five of these school shooters or those who were preparing to do so referenced Columbine as a motivation for their actions. And finally, one, the number of schools shootings per week, on average, at a school or college in 2015. Not only are we learning that we have failed to respond appropriately to the slaughtering of innocent children -- often times by children -- but that this horrific kind of carnage has multiplied exponentially across our entire society. We no longer have those kind of national crises about gun violence, particularly towards children. And this betrays a fundamental kind of woundedness that has not been addressed in conversations about violence, gun control, and even about the very basic commitments of our society as a whole. The consequences of violating one’s conscience, even if the act was unavoidable or seemed right at the time, can be devastating. Responses include overwhelming depression, guilt, and self-medication through alcohol or drugs. Moral injury can lead veterans to feelings of worthlessness, remorse, and despair; they may feel as if they lost their souls in combat and are no longer who they were. Connecting emotionally to others becomes impossible for those trapped inside the walls of such feelings. When the consequences become overwhelming, the only relief may seem to be to leave this life behind (xv-xvi). The contention that I want to explore here is this: When it comes to the increasingly common experience of gun violence in society, the persistent inability to respond in generative ways to the realities of gun violence, whether through gun control or even more fundamental interventions (like child abuse prevention, prison diversion programs, and the reform of the prison-industrial complex), is not rooted in a failure of imagination or resources, but in a cultural moral injury that is both unaddressed and perpetually exacerbated by ongoing gun violence. In other words, I think that our society shouldn't necessarily be understood as indifferent or even celebratory of this reality, but should understand it as a location of true woundedness in need of tangible, moral intervention. That this simple editorial reworking of Jennings’ assertion flows effortlessly should give us great pause as to the source of our political, moral, and theological impasse about the ubiquity and ferocity of the trauma and human suffering that is rooted in and caused by gun violence. Our willingness to confess that our historical incapacity to make meaningful and lasting societal changes around issues of gun violence as being the result of a cultural moral injury is, I believe, fundamental to real and lasting change around these questions in our society. 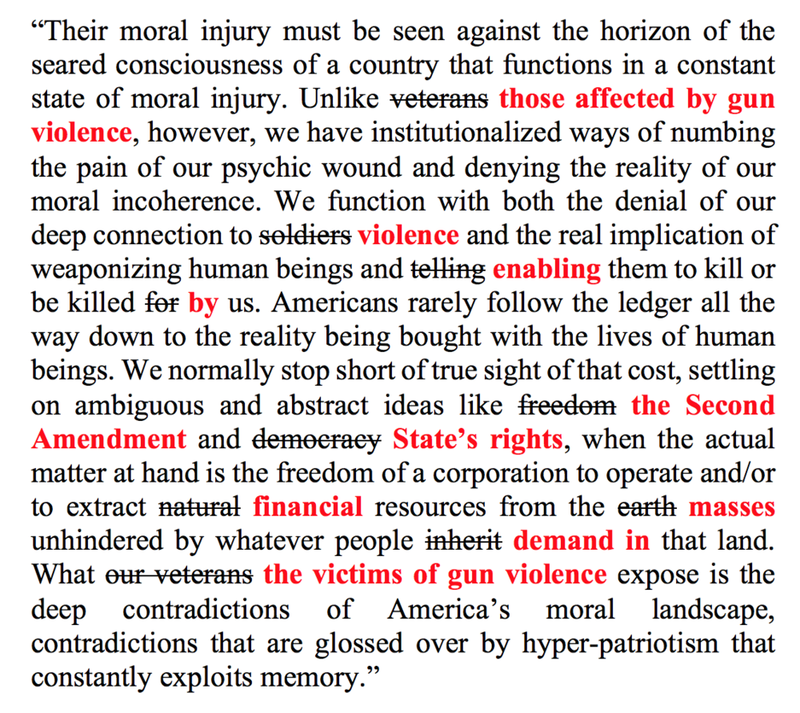 This contention is rooted in three fundamental observations: (1) A willingness to identify these realities as "injury" should lead directly to responses of empathy and compassion to those whose response to this common injury are different (or even opposite) of our own, (2) This admission enables us to all begin to articulate the ways in which gun violence in American society has misshaped and impacted us all regardless of our background, experience, or visceral responses to these issues, and (3) a "diagnosis" of moral injury enables us to return to the wounding experience(s) instead of only being caught up in the present chaos and disorientation. In order to revisit the realities of gun violence in American society, and to find places where our shared humanity, and therefore our shared need of redemption can emerge, we must begin the difficult yet unavoidable movement of remembering, reacting, and responding. This is no small task, and certainly not without pain, conflict, and perhaps even violence. It is important to remember that all those involved in this movement towards the restoring of communities and persons harmed by a cultural moral injury are in fact injured. While this always has the potential to devolve in the arguments (and even violence!) about the meaning of these questions and experiences, in this case remembering will most likely involve a commitment to allow individuals and communities to speak the truth for themselves and their communities and for others to enable them to be heard. I recognize that this is no small task. But too often what happens is that those with a shared injury but divergent responses unconsciously or sometimes even explicitly seek to undermine and illegitimate the concrete, lived experience of the Other. Sometimes this is because the experience of the other is perceived as threatening either to their worldview and ideology, to their own human dignity, or some other factor that causes the hearer to feel unbearably made into the Other. This is real and must be addressed. But perhaps the difference that we could make in this conversation is to no longer jump prematurely to "solutions" (e.g., More guns! or More gun control! ), but first to understand the depth and shape of the wounds and the wounded. I would contend that our inability to talk about the shared woundedness that we experience at these events (and I do believe that it is fundamentally a wounding), is rooted in our unwillingness to see these issues as human problems beyond the victim/perpetrator dichotomy that has so deeply infected our entire society. (For more about this read the absolutely brilliant book Conflict is Not Abuse: Overstating Harm, Community Responsibility, and the Duty of Repair by Sarah Schulman.) In other words, we have yet to come to grasp the ways in which we are all wounded by these realities. We are wounded in different ways, but in that woundedness we share a vulnerability and a need for redemption that I am convinced can only be found meaningfully together. One incredible example of this is the brave and heartbreaking memoir by Sue Klebold, the mother of one of the shooters in the Columbine Massacre entitled, A Mother's Reckoning: Living in the Aftermath of Tragedy. In it Klebold shares the story of a mother who must wrestle with the horrific murders committed by her son and the loss that it entails both morally and physically as her son Dylan committed suicide at the end of the attack. 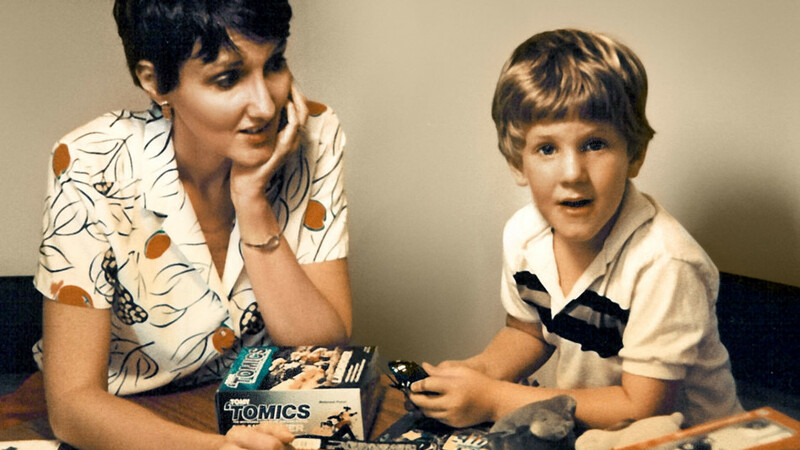 Dylan Klebold, one of the two shooters at Columbine High School, with his mother Sue Klebold on his fifth birthday. This is the language of grief and loss for sure, but it is also the language of moral injury. Or listen to this excerpt from someone on the other side of gun violence, Lezley McSpadden the mother of Michael Brown who was killed by police officer Darren Wilson in Ferguson, Missouri on August 9, 2014 (more than fifteen years after Columbine). This is from her book, Tell the Truth & Shame the Devil: The Life, Legacy, and Love of My Son Michael Brown. I can’t just say he was mine, though. When Mike Mike was born, he was adored, doted on and loved by me and his daddy, my siblings and his grandparents on both sides, who helped with his rearing. He was our beautiful, -unplanned surprise—my first son, a first grandson and the first nephew in my family. And then one day our Mike Mike was shot and killed by a police officer on Canfield Drive in Ferguson, Missouri, and suddenly his name was being spoken everywhere: Mike Brown, Jr., Michael Brown or just Brown…but never Mike Mike, never our family’s name for him, the name that marked him as special to us and those who knew him for real. Pastor Creflo Dollar asked me what I thought about all the people out there on Canfield Drive when I got to the scene the day Mike Mike was shot. I turned, looking directly at him, and as sure as the breath I’m breathing, in a very matter-of-fact way, said, “I didn’t see those people. That day, I was looking for one person: my son. Nobody else mattered.” I think I kind of shocked -Pastor -Dollar. I was respectful, of course, but I had to tell it to him straight up. I was just keeping it real. You see, because as a mother, when your child is hurt, scared or in danger, you hurt, you want to comfort them, and you will protect them from harm, even if it means -laying your own life down. That day out on Canfield Drive, I had tunnel vision. Nothing and nobody was more -important than getting to Mike Mike and helping him in any way I could. It wasn’t until days later, when I looked at the news and people showed me pictures from their phones that I saw the crowd of folks who had been out there. So the only way I can really describe that day is to compare it to the day I had Mike Mike. Bringing him into the world was almost the same feeling as when he left here—a lot of people making noise and milling around, and my attention just glued to my new baby boy. I’m not going to lie; I’ve been wanting to get mad and just go f--k the world up, because my son being killed has messed my whole life up. No way should my son have left here before me. But I have to stop myself every time my anger begins to build like that. If I look at it that way too long, I’ll find myself in trouble, doing something out of rage and revenge. That would be out of my character, and Mike Mike would never want me to do anything like that. It’s so hard sometimes, but I have to find some type of something to keep myself calm so I can be a good wife and mother for my other kids. That’s why, looking at my son’s death today, I try to see it from more of a spiritual standpoint. God let me have Mike Mike for 18 years. He wouldn’t let me have him longer because He had other plans for us. Those plans are still being revealed to me, but I believe a big part of His plans was to wake people up to some things in the world that need changing. I’m ready, though, for whatever He has in store. I find a way to smile because my baby had aspirations and dreams. That really gives me comfort on the low days. That’s why I got to clear things up, because folks out here got it twisted: Mike wasn’t a criminal who deserved to be shot like a -dangerous animal. He was a good boy who cared about the right things, and family and friends were at the top of his list. He didn’t have a police record. He never got in trouble. He was a techie, in love with computers. He loved his mama and was proud to be headed to college and of the things he knew. The whole family was proud of him, too. When my son was killed, everybody had his or her own version of how everything went down. Cops with their version of the facts. People living in the Canfield Apartments with another. The television and newspaper people, EMTs, firemen, old people, young people, Black, White, you name it—everyone with a different story that was supposed to be the truth about my son’s last minutes on earth. My son was dead on the street in front of the world, and everybody -except Mike Mike was busy telling his story. Even in the months since that horrible day, people still haven’t stopped talking, from Twitter to Facebook to Instagram, in the beauty shop and coffee shop, everywhere. Well, let me just say this: I wasn’t there when Mike Mike was shot. I didn’t see him fall or take his last breath, but as his mother, I do know one thing better than anyone, and that’s how to tell my son’s story, and the journey we shared together as mother and son. I don’t wish this pain, this struggle, this hurt, this void, this guilt or this grief on anybody. After Mike Mike died, I believed we would have justice. I waited for the police to right the wrong, I waited for the county to bring justice for Mike Mike, I waited for the DOJ to discover the truth. The system has failed my son. It has failed me and it has failed all of us. But, now, I know that I can’t wait for anybody else to make change. I must make change, myself. That will be Mike Mike’s legacy; that will be his justice. It doesn't take long to determine that the capacity of persons and communities to react, especially to tragedies that exacerbate longstanding moral injuries, is rarely, if ever, lacking. And it is even easier to recognize that these reactions are often hot-headed, unproductive, and often contribute to alienation and polarization more than they address and redress it. And this is certainly not the kind of "reaction" that I am calling for in my proposal. Instead, I am calling for reactions to the articulation and confession of serious social, emotional, psychological, spiritual, and moral injuries. The kind of reactions that are necessary in the wake of moral injury include the following: empathy, lament, and solidarity. Empathy. This is the commitment to open oneself to the experiences, emotions, and lived experience of the Other in a way that is allowed to directly affect you as an individual and as a community of persons. It is the willingness to ask yourself questions like, "Can I imagine what I might have felt had I been in that position?" "Can I understand why that would have been the way that such a person or community would have reacted to this situation?" "How would I have wanted people to respond to me and to my community in the midst of that experience?" "Can I recognize the ways in which I am too remote or removed from that person's experience that I recognize that I am left at times with no other recourse but to simply listen?" Lament. This is the willingness to admit that things are not right in the world. In the Christian Tradition this typically involves a kind of prayer or protest that seeks (or even demands) divine intervention. But regardless of religious commitments, lament is simply the willingness and the bravery to name the injustice, the trauma, the unexpected wounding, the sorrow, and the inability to make things right (maybe ever). This is a fundamental piece of dealing with moral injury that, in so many ways, is fundamentally counter-cultural to just about everything that American culture is built on. Solidarity. This is the most embodied, and the most risky of the three responses. Solidarity is a commitment to being "with" that involves the concrete, tangible placement of our bodies, our agency, and our safety. It is anything but #ThoughtsAndPrayers. It is also the reaction that has the most potential to be misshaped. It can become a place for all kinds of oppression: colonialism, patriarchy, sexism, elitism, racism, etc. It is for this reason that true, meaningful, productive solidarity can only come after intentional and productive empathy and lament. By this point individuals and communities have engaged in meaningful efforts to (re)humanize the Other, to allow that difference to effect themselves, and are now (at least beginning to be) in a position to respond in more constructive ways. But what is important here is that, if the previous steps have been undertaken consciously, intentionally, and without hurry to come to a "resolution" then this process of responding will not be one side responding to the other, but will instead be a kind of synergistic movement together. This is too often one of the fundamental problems/challenges of controversial issues is that one side expects the other to respond in a particular way with no imagination for how they might come together to a new vision of life together around certain issues or challenges. This will always look different from situation to situation and from context to context, but perhaps the fundamental guiding principle can be taken here from Paul's most succinct summary of the Christian faith: "Love does no wrong to a neighbor; therefore, love is the fulfilling of the law." (Romans 13:10, NRSV). But is this really reasonable? Isn't this just the dreaming of an overly impractical solution to a real problem where real people are literally losing their lives everyday? I believe that this is an absolutely valid question. I want to simply say two things to this: (1) Until we deal with the underlying moral injuries of gun violence I am thoroughly convinced that a long-lasting solution which actually gets at the underlying issues of gun violence (and they are many) will not begin to be resolved, and (2) issues this long, complex, and entrenched aren't solved more easily than they were created in the first place. The complexity of a solution does not legislate against its legitimacy. Ultimately, the reason that I suggest that this is one of the issues that must be addressed is that, at least for people of Christian faith, this is a moral issue. It is a moral issue in two senses: (1) It deals with our values about the value of life, the dignity of human beings, the inappropriateness of violence, and (what should be) our eternal intolerance for injustice and oppression. (2) It is moral in the sense that it has violated our fundamental beliefs about how the world should be. None of us believe that we should live in a world where we have to wonder if we will be murdered in the streets or subjected to other forms of violence. No one wishes this for themselves, and this should motivate us to work towards its prevention against others. I am always skeptical when someone suggests that there is a single way forward, and that is why I wish to conclude by suggesting that there is a single posture that must dominate this (and every) difficult/contentious/contested conversation about issues that affect real people in the everyday, concrete lives. The posture is this: We must approach one another as members of the wounded community known as humanity. We must see in one another our shared woundedness and together seek our specific and irreproducible redemption. Dear Lord, please let it be so of us.